I had a roller coaster ride on Etsy. Up and down, but mostly down. I am back and doing pretty good, but I am selling supplies. The few finished pieces or custom pieces I offer have had no interest. I am selling my vintage sequins well, and some other supplies. I am taking it day by day, I have a finite amount of supplies to sell, fortunately still a good amount of some things, buy many are sold out and no more is to be had. So, once the items I have in the studio are sold, where do I go then ? Well , my husband and I plan to work together to make some lovely copper foil jewelry and pendants of different sizes that can be sold as supplies, and even personalized. We have not gotten past the talk phase as his studio is still being set up in his spare time which has been limited. We have a lot of ideas with his stained glass and I have some other ideas I am kicking around in my head for now. It is insanely hard to sell finished pieces on Etsy. People do it all the time, do not get me wrong, but it is hard. I hope to make more findings, and see how that goes. I have sold some, but I have only made copper up until now, need to do some silver and maybe gold, not real gold, but gold tone metal. So, that is something I may work on. I would also love to make some beads , paper, and some recycled beads as well. I would love to work with polymer clay, have all the supplies, just have to get it out and work with it. So, so many options, just considering them all. I will mainly stay with making supplies or finding unique and unusual stuff to resell as supplies. I will always have a few listings of handmade items, and have sold some, but the majority of my sales have been supplies. I love finding old jewelry and taking it apart to reuse or to sell for others to reuse. to continue with my current Etsy shop and see what supplies I can find to resell and what findings or beads I can make to sell. my husband and I do plan to do a Youtube channel on all kinds of stuff, still working that out but have done a few videos we might use. He plans to eventually open a shop for stained glass kits, patterns and some finished pieces, whether that will happen in 2018 or not, we are not sure. He works a full time job plus any overtime they offer, so when he is off, he has a list for our 94 year old house, plus large yards, and then his studio organization , and then creating !! He is a man with little down time. and so many more projects. 2018 will be a busy year for us. So, that is what is going on. I know I have been up and down the last year or two, but finally found a small niche. I am not making great money, but it is great to me. I have made 788.00 this year but that does not account for my costs, my time, and I am not entirely sure that is before fees or not. I get charged listing fees, selling fees and then however they pay , I get a charge for that as well. But, that is still great, over half of that has been in the last month, but it is also Christmas time, that is to be expected. Lots of holiday sequins sold, and Christmas colors sold. I also got a big almost 200 order from a customer that ordered from me 2 years ago. Wine charms for her to resell. So, a good year, much better than the last few, but got to up it a bit next year. Would love to make a few hundred every month. That is my goal for next year, 2 to 5 hundred a month, which is a pretty lofty goal, but you have to shoot high I suppose. 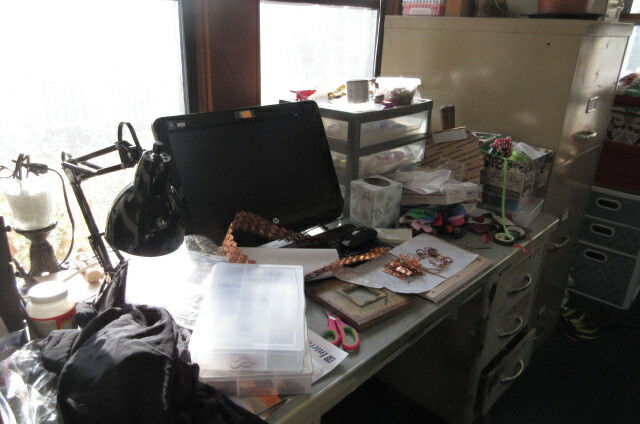 This is what my studio looks like when I am creating and selling. 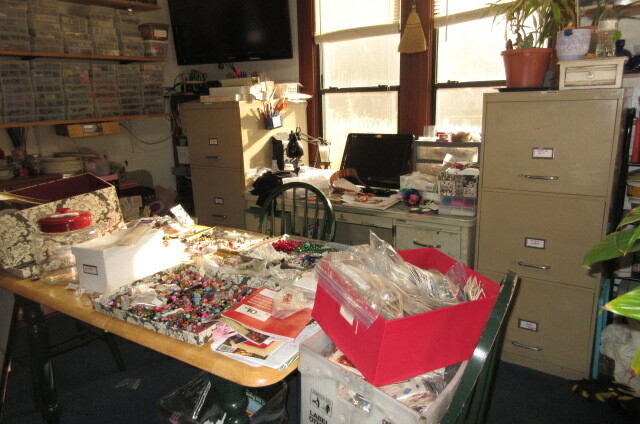 Big trays of beads out, boxes of sequins out, I have two big ones of my for sale sequins sitting on the chair , my spare desk covered, just a mess. I know of no other way to create !! 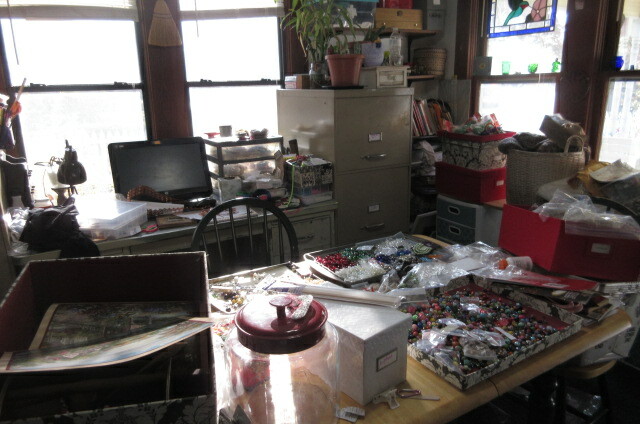 I like the creative mess, but at some point it will have to get put up , and it will. Well, did not plan on such a long post. I just wanted to let all the wonderful people who have supported me on this journey and have read my blog know that despite my almost giving up a few times, I am working hard still to build this business to something that has some reliable income. I am looking forward to trying new things and seeing what I can accomplish. Letting go of the jewelry designing thing was hard, but now I just make for myself, friends and family !!! Thanks again, your support means everything to me ! ← Enjoying the holiday season !! OMG if I go back in to play with clay there goes painting lol it is so much fun!!!!! !